Tulip and her three babies on their first outing. 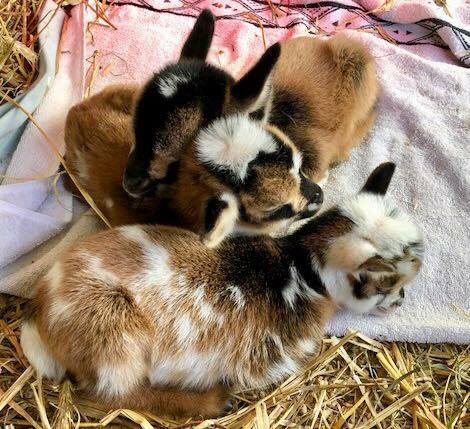 Returning Home Farm and proud mama goat, Tulip, are proud to announce the birth and public debut of her triplet goats: Burrito (male), MinnieT (female), and Willowette (female.) They were born on April 5, 2018. The delivery was uneventful. Tulip did it all on her own in 20 minutes. It was her first time giving birth. 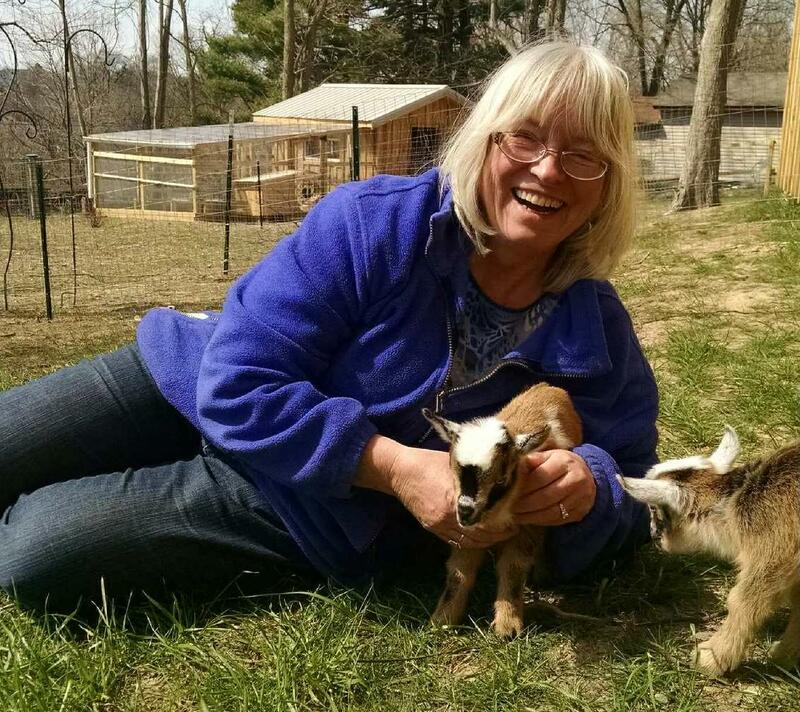 The baby goats spent a month in privacy with their mother and the Returning Home staff. Tbey all had their first outing outside the pen to Yoga With Goats this past Saturday and had a great time…napped afterwards! The girls have a home to go to later in the summer. Burrito is available for adoption as a buck or wether. We will continue to post photos of the babies as they grow and prepare for future adventures. You can join us any Saturday this summer for Yoga With Goats to meet them in person. 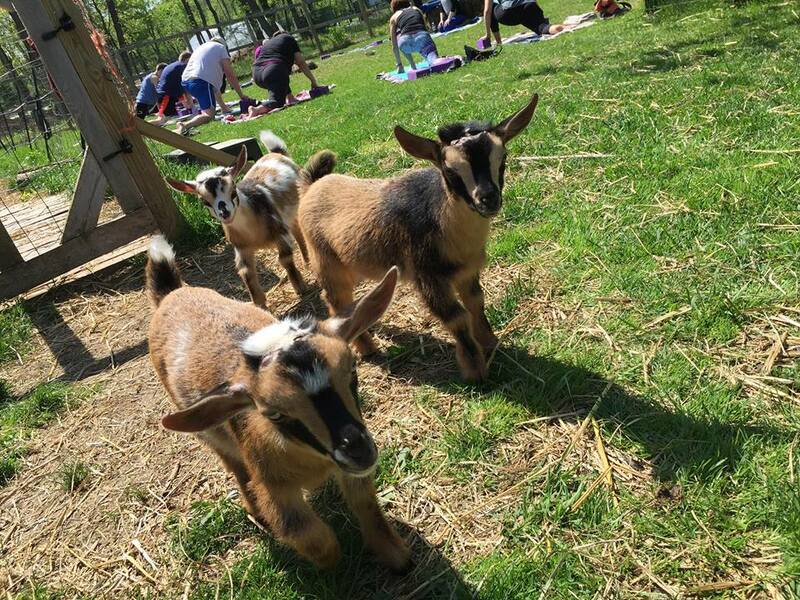 Or come to the picnic on Saturday June 9 from 11-4 where you can meet the babies, sample yoga with goats, see goat races, etc. To stay in touch with the goats and other critters of Returning Home Farm, please join our email list. 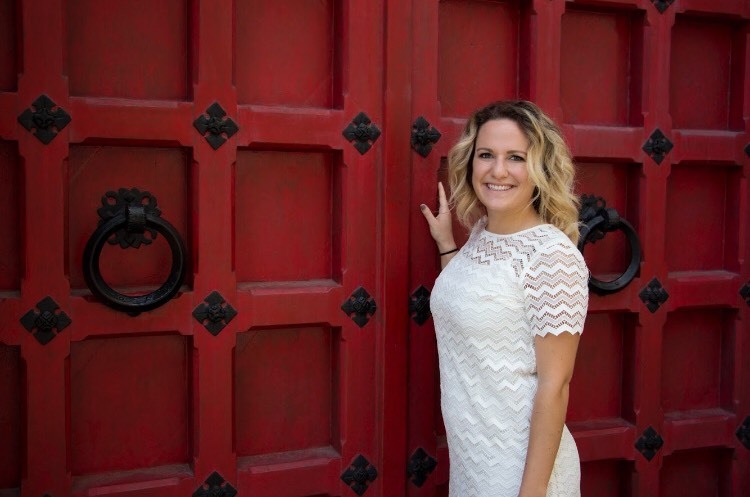 Penn Forest is very pleased to welcome our summer intern, Sara Walker. 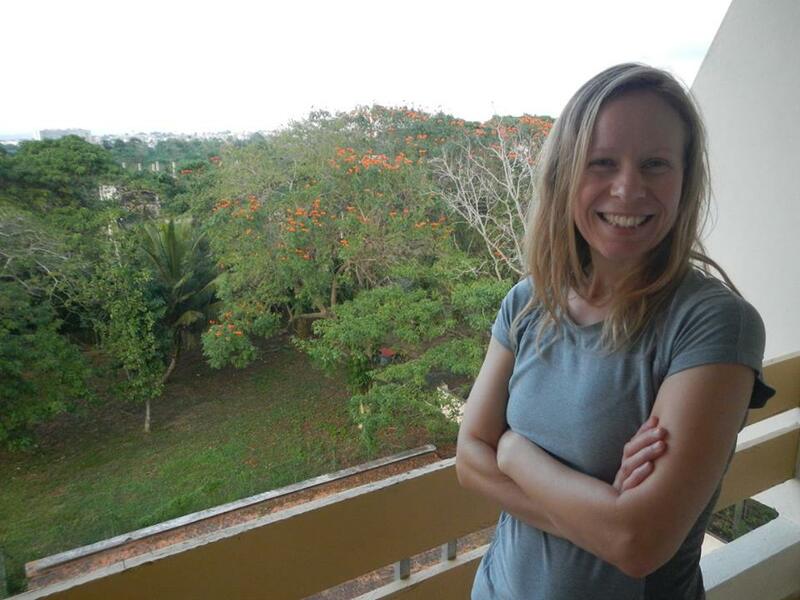 She’s in the Masters of Sustainability program at Chatham University. She will join us in a few weeks. Sara has a BA from the University of Pittsburgh. Her work experience includes working as a conservation educator and doing field work at Yellowstone National Park. During her time with Penn Forest, Sara will be working along side our Assistant Manager, Laura on a variety of sustainability and ecology project. Please welcome her to the team. 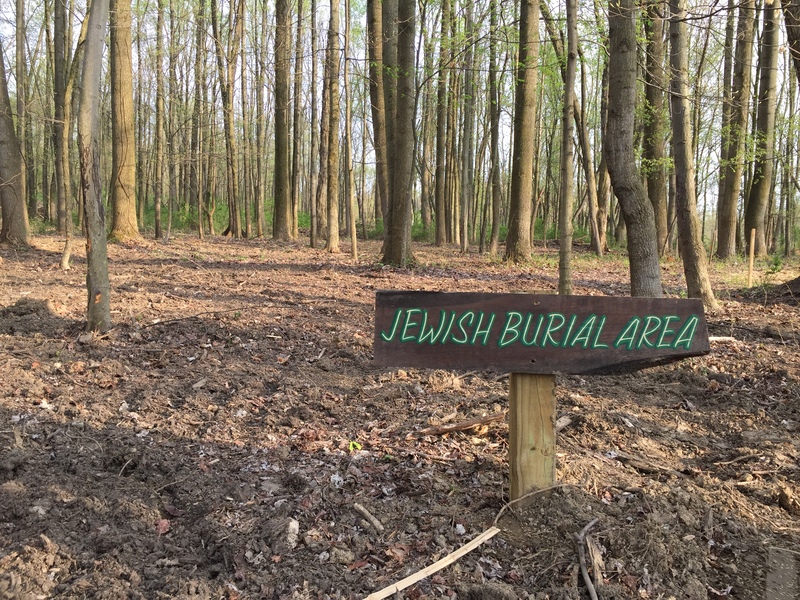 We have important updates about the Jewish Burial Grove at Penn Forest Natural Burial Park. Please share this information with individuals who may be interested. Sanctified for Jewish Burial by Rabbi Stephen E. Steindel. Woodland natural burial among our trees. Located in Verona PA—13-miles from downtown Pittsburgh. Only biodegradable coffins or shrouds allowed. Currently adding 112 additional grave sites. No extra fees for Sunday burials. Tents and chairs provided for graveside services at no extra cost. We work with all funeral homes. We honor all Jewish burial practices. Call 412-265-4606 for tour appointments or other information or email Laura at PennForestCemetery.com. All prices on our website: www.PennForestCemetery.com/pricing. Your Role with Penn Forest Cemetery: Officially I am President of Land Conservation Cemeteries, an LLC that owns Penn Forest Natural Burial Park and, along with Pete McQuillin, a majority owner of the business. Unofficially that means I weigh in on all major decisions and many of the everyday ones. Describe a typical day for you at Penn Forest. My time is spent in planning meetings, cemetery and barn chores, administrative tasks. I’ve been involved with almost every aspect of Penn Forest, including finding the land, creating the business plan, building the farm, and now plans for the Remembrance Garden. In inclement weather I have opened our home to gathering mourners. How did you get connected with Penn Forest Cemetery? It was in a conversation with Pete about our own wishes for a green burial that the idea of creating a green cemetery here in Pittsburgh was first conceived in 2008. We both wanted to be buried in an environmentally-friendly way and there was no option for that locally. So we decided to build one here, having no idea what we were getting into. Fortunately we have had wonderful help every step of the way and made lifelong friendships. What are some of your responsibilities and duties? I feel a responsibility for all the things that happen here, even if I’m not directly involved. My main duty is to keep an eye on everything. We moved out to the cemetery a few years ago so that we could do that 24/7. Caring for the cemetery is woven completely into our lives. Describe one thing about Penn Forest that the average person might not know or find surprising. Penn Forest is more about life than death. For life to flourish, death must happen. You know, “the cycle of life”. We offer people a chance to personally participate in it through their death but while they are alive, they can enjoy the farm animals, wildlife, and nature. Lot owners are welcome to hang out in the barn, have a picnic in the meadow, get a discount on Yoga with Goats classes. We have lots of ideas about how to continue developing Penn Forest so it is an inviting and educational conservation park. Why is green burial important to you? Green burial is the most efficient way to return my body to nature so that it can support future life. I find it comforting that after my death my organic matter remains organic, just in different forms. Tell us about your connection to Pittsburgh. Are you a native of this region? A transplant? I grew up in the DC suburbs but my father grew up on Beaver Grade Road in Robinson. I spent my summers on my grandparents’ 300 acre dairy farm, called Hidden Brook Farm. Those were formative years for me and I found joy being in the woods and with the animals. When I was looking for a college, Chatham College was just far enough from home and a horticultural treasure. Pittsburgh, the city, grew on me over the years and I became a big fan. As an adult I found out my grandfather, Charles Chubb, was an early President of the Western Pennsylvania Conservancy. I think he would approve of the work we are doing to restore the eco-system at Penn Forest. Do you have a favorite tree at Penn Forest, either a specific type of tree or an actual tree that resonates with you? This land was a farm until the 1950s and so it was cleared for fields. There are a few big old trees scattered around. They’re my favorites. I wish I could be around in 100 years to see how the trees we are planting now mature. With our focus on increasing the diversity of the trees, it will be even more beautiful. This is one in an occasional series profiling the people involved with Penn Forest Cemetery and our multiple projects. 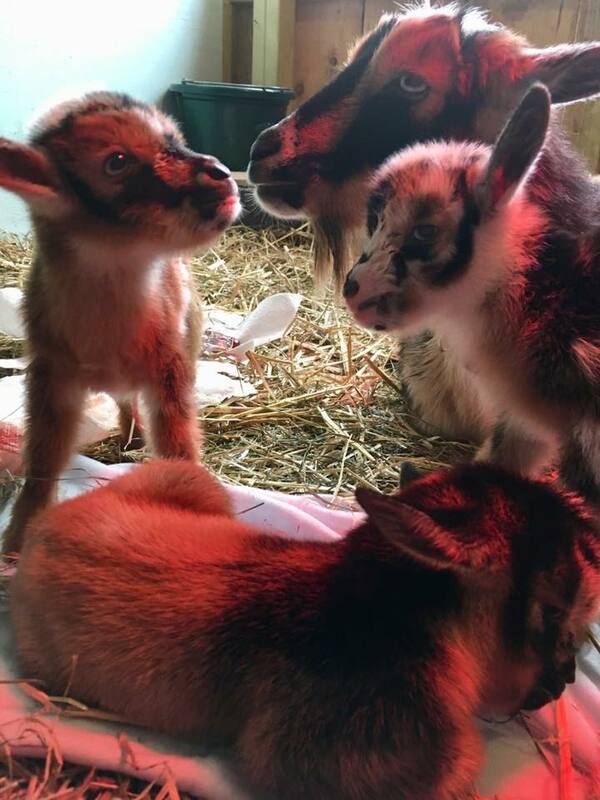 On April 6, 2018 our goat, Tulip, gave birth to three little goats. Everyone is doing well. 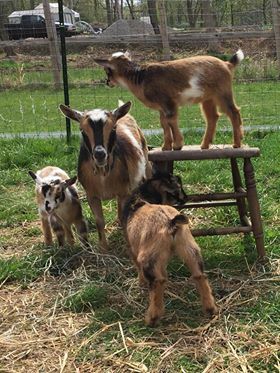 The babies will not be receiving visitors just yet, but we enourage you to sign up for ‘Yoga With Goats’ starting May 5 where we’ll have an update and let you know when you can meet the babies. 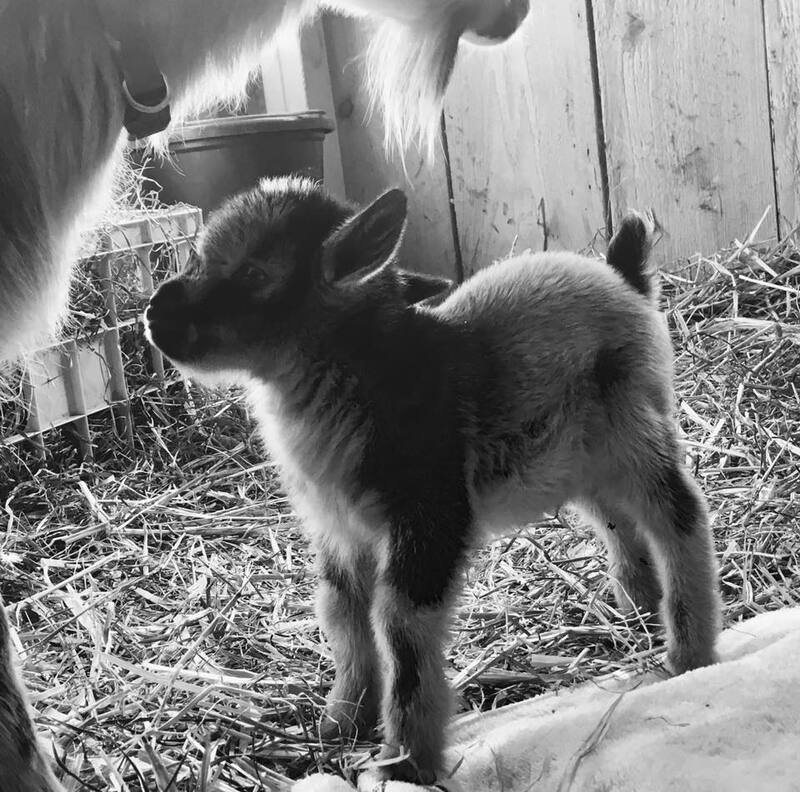 Because our team is busy preparing for spring and summer activities AND caring for Tulip & her kids, we don’t have a play by play for you on the birth, but please consider reading this link on goat pregnancy and birth if you are curious. We will post more photos soon. Please feel free to leave a comment with a message for Tulip and her kids. You can see the album on our Facebook page (it is open to the public.) Click on the photo below. I don’t think that any days are typical here, which I love! It is really great to have a variety of indoor and outdoor work that changes everyday. I am learning how to do everything here. So, it can be anything from pruning fruit trees, gardening, weeding, removing excess dirt off graves, installing grave markers, preparing for and having burials, giving tours, sales, office work, etc. One thing that I love about Penn Forest that the average person may not know are the different projects going on here. There’s a couple of different types of gardens, the farm animals, composting from the barn waste, aquaponics, beehives, willow and berry patches, yoga with goats, and hiking trails! Green burial is important to me because I believe that we have a responsibility to use the earth in a manner that allows it to sustain future generations in a wholesome way. That means that we should not be filling it with anything harmful. With green burial there are no toxic embalming fluids, no concrete burial vaults, no metals going into the ground, no harmful pesticides in the grassy areas. Green burial allows bodies to return to the earth naturally contributing to healthy soil and waterways. I was born in Pittsburgh and have lived in this area ever since. I have had the privilege of experiencing both the city and country life. In the city I’ve lived in Brookline, South Side, the Hill District, Etna, and Sharpsburg. In the country I’ve lived in Southern Butler County and in the Deer Lakes area. I love both and feel fortunate to have been able to experience what it is like to live in the different settings. tree or an actual tree that resonates with you? My favorite tree at Penn Forest is the Tulip Poplar. The leaves look like tulips! I had never seen them before and I am completely enamored with them! We received this email from Jim Greenberg in March. He gave us permission to post it here. Linda was buried March 15th. This is not a classic cemetery in that it lacks vertical headstones and mausoleums. Natural (“green”) burial is the rule. Bodies are not embalmed or preserved and are usually buried shortly after death in a shroud or natural casket. The concept of green burial is based on the biblical concept, “You were made of the earth and to the earth shall you return.” That is, once the soul and spirit of the individual have left the physical body, the components of the body should return into the earth as quickly as possible in order to maintain the flow of nature. The property is quite large and beautiful with woods, meadows, and a variety of other settings to choose from for your loved one. We walked around with the proprietor until we found a spot we liked at the edge of the woods with views of the meadow. There are a limited number of cemeteries that are in sync with the green burial movement, and we are fortunate to have Penn Forest in Pittsburgh. I will be in touch soon (as this crappy weather disappears); there is Death Café in April. Many of the guests were impressed positively with this kind of interment and graveside ceremony. p.s. – If any potential clients want to talk to someone who’s been there, feel free to pass along my contact information. Have you written your Departure Directions and given them to your family? If you have and they include Penn Forest, we’d love to have a copy to put in your file. That way we’ll know your wishes at your time of death and we’ll be ready to help pass them on to your funeral arrangers. Note: you do not need to have a pre-paid account to have a file. You can set up a file with us at any time. Departure Directions is the term for your written instructions or guidelines—determined by your values, beliefs and priorities—for how you wish to be cared for and remembered after you die (your after-death care). It includes how your body will be cared for and by whom, how you will be laid to rest, who you would like to involve, and what rituals, if any, will be carried out. Departure Directions can also address things like what name you and pronouns should be used in your preferred rituals, as well how your body should be dressed or garbed. You can also designate who will have the final decision for your arrangements. Reflect on a death ritual you attended and consider what was great about it and how it impacted you. Reflect on three-to-five core values that guide the way you live and think about how they can guide the way you are cared for after you die. How would you explain your beliefs about what happens to you when you die? 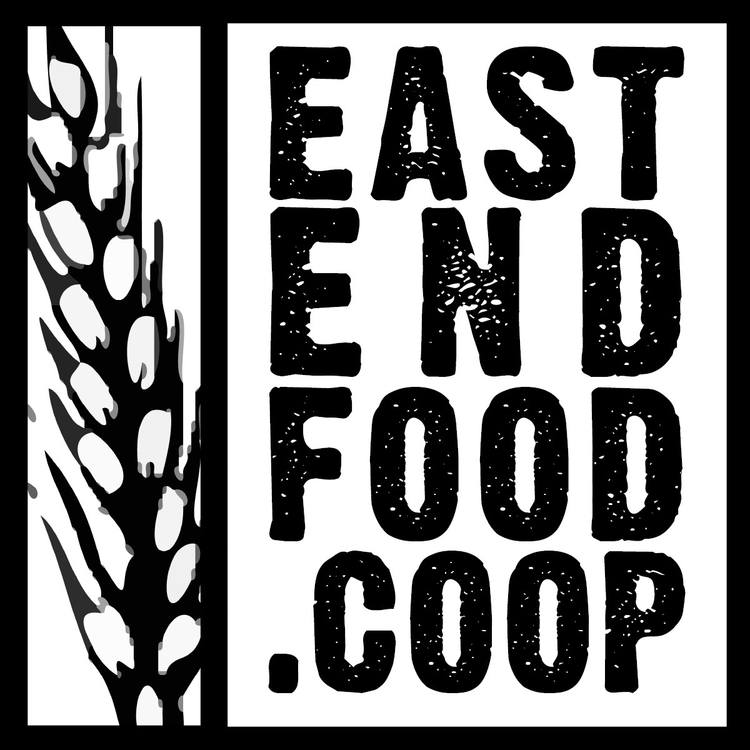 We are pleased to announce that we have joined the community partner program with the East End Food Co-op. This means we will offer discounts to Co-op members: $100 off full body cemetery lots, $50 off cremated remains lots, 10% off other products and services. This is an exciting joint adventure. Just bring your membership card with you when you sign up for any services with us. 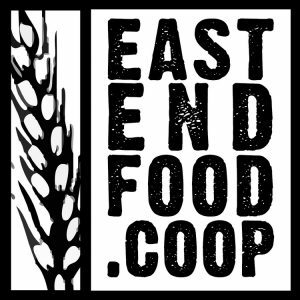 This is one way for sustainable groups and business to support one another.